Takes ownership for the broad supply chain from its suppliers’ suppliers to its customers’ customers. Segments its business by customer-application to focus its efforts on providing the products and services its customer’s value as captured in critical success factors. Sets its strategic goals to simultaneously achieve supply-chain imperatives (HS&E and quality), shareholder-driven goals, and customer-anchoring goals. Drives customer requirements deep into the sales and operations planning, manufacturing, and procurement processes. Implements supply-chain initiatives to tighten the links in the supply chain value stream to deliver the products and services the customer wants in short lead times, at the lowest cost and with less inventory. Delivers on the promise of building sustainable competitive advantage. 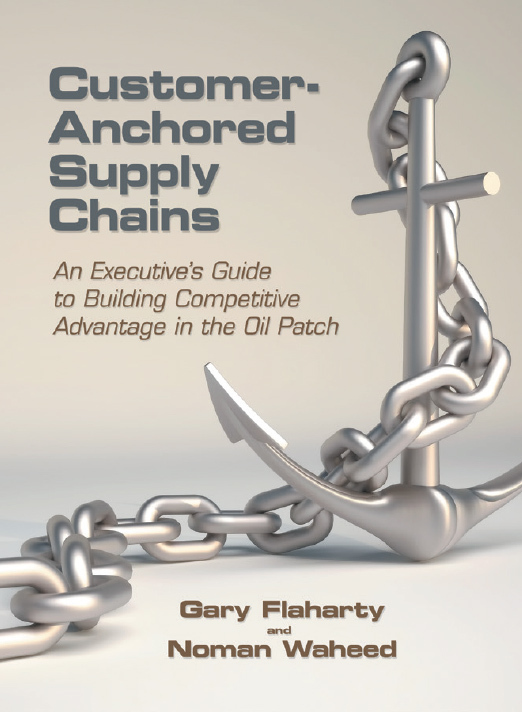 Customer-Anchored Supply Chains is written for the oil and gas companies, oilfield service companies, and their suppliers who comprise the global energy supply chain. Executives seeking to streamline their supply chain operations and build sustainable competitive advantage need to understand, implement and master customer-anchored supply chains. The founders of SCLinx, a supply chain management consulting firm, provide a detailed analysis of why anchoring your supply chain is critical to outpacing rivals. Flaharty and Waheed, who served as executives at Baker Hughes before forming SCLinx, give you the insights and instructions you need to think holistically, segment by customer-applications, incorporate the voice of the customer into supply chain’s strategic plans, and implement customer-anchored sales and operations planning. Written for the executive by executives, the book includes counsel on managing the links of the supply chain to deliver the results that your customer values, with shorter lead times, lower costs, and less inventory. The book’s oilfield examples and executive checklists make it easier to understand and apply the industry leading practices you will need to master customer-anchored supply chains.